I think a critical piece of the puzzle in recovering enchantment is embracing the immanence of God. To unpack that very important word, immanence describes how God indwells and permeates creation. 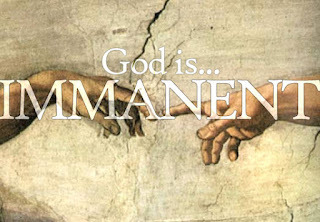 Immanence can be contrasted with transcendence, the way God is separate from creation. Immanence speaks to how God is in creation, transcendence to how God is outside creation. The irony of transcendence, often celebrated in praise music as the "awesomeness" of God, is how it tends toward disenchantment. With God exalted as King ruling over and above creation, God is subtly pulled out of creation. Rather than indwelling God evacuates creation. Transcendence also tends toward deism, furthering our disenchantment. When transcendence is emphasized, highlighting God's separateness and Otherness from creation, God's actions in the world are conceptualized as intrusions, miraculous suspensions of the daily flux of cause and effect. But as science has progressed these miraculous intrusions are harder to believe in. And when you starting doubting the miracles of the transcendent God you, by default, find yourself in deism. A God who is out there, somewhere, but a God who doesn't miraculously intrude upon creation. In light of all this, we edge back toward enchantment when we begin to emphasize the immanence of God, God indwelling creation. Miracles aren't the intrusions of a transcendent God but the enchantment of creation itself. No one described this better than the Catholic poet Gerard Manley Hopkins. Edging toward enchantment involves emphasizing the immanence of God, experiencing the world as charged with the grandeur of God.